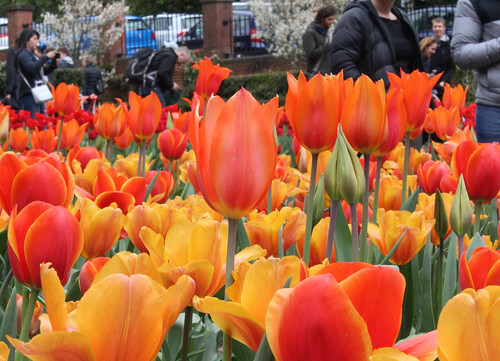 Wellington Botanic Garden welcomed Spring by intertwining Dutch culture with Tulip Sunday last weekend. The event involved Dutch food stalls and displays among gardens of freshly grown Tulips. Andrew Moonen was one who stood out from the displays with his western european street organ. The organ plays preset carnival-style tunes when he turns a rotating handle. “The holes in the paper open up a valve and let the air flow into the pipe,” explains Andrew. He has been operating the instrument for the past five years. “It’s hard work, you’re standing all the time,” laughs Adrian. Her Excellency, the Netherlands Ambassador Ms Mira Woldberg also gave a talk about the importance of remembering the Dutch in New Zealand after WW2. The event was a part of the annual Wellington Spring Festival.